It was exhilarating to be among a million people peacefully protesting the negative and backward facing views of Trump and his supporters, people defiantly lifting their voices and placards to declare love trumps hate and women’s rights are human rights. Were there really a million people there? No one knows because the crowd was so huge it flowed out of Independence Avenue, the planned rally and march site, over the mall and into all the surrounding streets. Published estimates say there were more than 500,000 people at the march. Metro ridership was the second highest in history on Saturday; 1,001,613 people, topped only by the 1.1 million for Obama’s first inauguration and far surpassing the 570,557 for Trump’s. 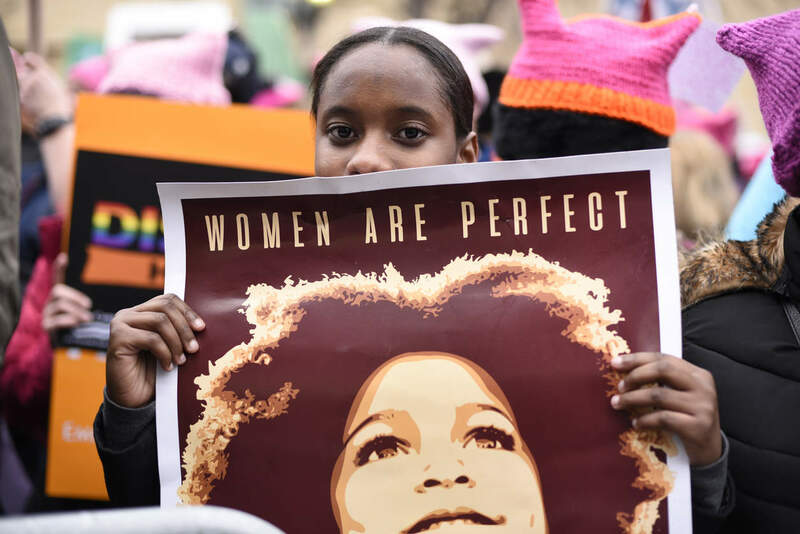 The Women’s March on Washington website’s current estimate is that 4,834,000 people participated in 673 sister marches around the world, on every continent including Antarctica, and that there were a million marchers in D.C. No one disputes that Saturday’s demonstrations were the largest political protest in U.S. history. But am I getting distracted by numbers, just like Trump? Perhaps, so I’ll get back to the point (something Trump doesn’t seem to be able to hang on to) because we need to take action to limit the damage of a president who cares more about crowd size than governing. The exhilaration is receding, especially after a weekend when the new administration showed us that lying is the new normal and any shred of hope we had for a less than disastrous Trump administration was naive. It’s time to turn resistance into organization. Now that we’re closer and know how many stand with us, what do we do? The Women’s March has laid out 10 actions for 100 days. “It doesn’t end here – now is not the time to hang up our marching shoes – it’s time to get our friends, family and community together and make history. That’s why we’re launching a new campaign: 10 Actions for the first 100 Days. Every 10 days we will take action on an issue we all care about, starting today.” You can start by going to the website and get active. At the beginning of January the NY Times published an Op-Ed by former congressional staffers introducing Indivisible: A Practical Guide for Resisting the Trump Administration. The guide borrows organizing principles from the Tea Party movement — work locally to influence members of Congress and be sure your representatives know what you want and that you’re watching to be sure they’re paying attention. “To this end, the following chapters offer a step-by-step guide for individuals, groups, and organizations looking to replicate the Tea Party’s success in getting Congress to listen to a small, vocal, dedicated group of constituents.” Check it out. Did you know you can Petition the White House on the Issues that Matter to You? Start a petition and if it gets 100,000 signatures in 30 days you’ll get an official response from the White House. A petition calling for Trump to release his tax returns has gotten over 250,000 signatures since Friday. The official White House response from Kellyanne Conway? Not going to happen. “We litigated this all through the election. People didn’t care, they voted for him.” Well, actually more people voted for Hillary than him, remember? If you don’t agree with Kellyanne, go to the website and sign the petition. Or the one that asks the White House to add LGBT rights, climate change and civil rights back to the list of issues on the White House website. Those were deleted within hours of Trump taking the oath of office. Or check out Swing Left, which declares, “It starts with the House. Don’t despair. Mobilize.” The website provides a map of congressional districts that were decided by a margin of less than 15% and where organized action can help get Democrats elected in 2018. Both of NH’s districts are on the map — Annie Kuster only won by 15,546 votes and Carol Shea-Porter by 4,904. Swing Left’s strategy makes a lot of sense — “unify progressives who promote tolerance, equality, unity and fairness. . . to out-organize Republicans” in House races that get less attention and money than Senate races, providing more opportunity for impact. See you out there, changing our future, making sure we have one. Next PostNext Don’t Be Fooled; Renew and Resist!